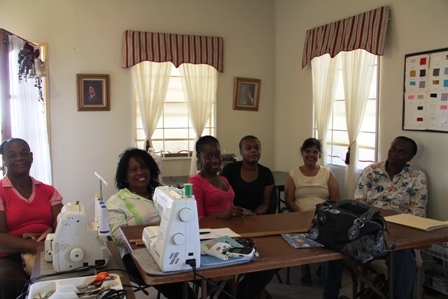 NIA-CHARLESTOWN NEVIS (August 19, 2011) – An ongoing three-week Industrial Sewing Workshop which commenced officially on Monday August 15th , is part of the Nevis Island Administration’s (NIA) thrust to develop the skills base on Nevis. That disclosure was made by Permanent Secretary in the Ministry of Trade Mr. Dwight Morton at a brief opening ceremony as he represented Trade Minister Dwight Cozier who was at the time overseas on Government business. The short course is an initiative of the Small Enterprise Development Unit (SEDU) in the Ministry of Trade and funded by the Caribbean Development Bank (CDB). The workshop is facilitated by Ms. Marie Mason at her Ramsbury office and is an initiative of the Small Enterprise Development Unit in the Ministry of Trade. “The idea is if we can get our people trained we can develop our skill base in Nevis. If we can get our population trained in Nevis, we would be able to provide the types of skills that are well needed in this country. “So very often we have to depend on bringing in persons to provide the skills that we need here and all we really need to do is to provide the avenue for training for our people. Our people are quite capable, I know, of getting to this level where they can provide the type of quality work, if they get the opportunity to be trained,” he said. Mr. Morton used the opportunity to expound on the role of SEDU and noted that the Unit was mandated to work with small businesses on Nevis to assist them in their development and to get those not yet started to begin. “I want to say to you that SEDU is here to assist you, not only in terms of technical training but in terms of a little financing. I did not say small because we do not have much money available right now but certainly, if you can put forward a proposal which is feasible, I am certain that we can provide you with a little loan maybe to buy a little machine that cost about $5,000 to assist you in continuing your sewing,” the Permanent Secretary told participants. He said the Unit had fitted in the Nevis Island Administration’s thrust of training and to promote small business since they were the backbone of any economy and once small businesses suffered, the economy suffered as a result. 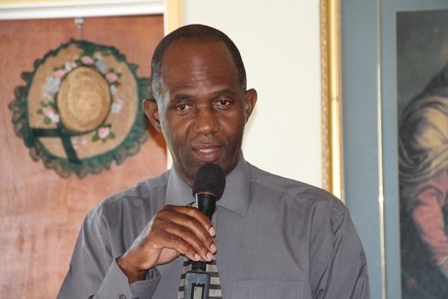 The intention therefore, has been to boost the development of small businesses in Nevis through technical assistance, training, loan arrangements and any other assistance possible. Mr. Morton also lauded the participants for their positive response to the call of training and encouraged them to make the best use of the opportunity. To those who would later become aware of the workshop Mr. Morton said he was certain there would be other opportunities and anyone interested should go to the Ministry of Trade’s office on Government Road, indicate their interest in terms of training and the office would work with the CDB to make the training available to them. “So today I congratulate you for taking up the challenge and I am certain when your training is completed in three weeks time, I believe that I can visit your workplace or business place to show off what you have learnt during these three weeks,” he said.